The 2019 class officially ends on Wednesday when a lackluster national signing day comes and goes with little fanfare or potential fireworks thanks to the early signing period in December. Texas signed 22 prospects in December and hasn’t added a single commitment since (unless the transfer of five-star athlete Bru McCoy counts). This is the new normal. February is now a formality for all but a handful of prospects. Texas’ class consists of 24 prospects, 23 of whom are locked into national letters of intent. The Longhorns expect to add the signature of four-star offensive tackle Javonne Shepherd at 1 p.m. Wednesday. Texas’ class is ranked third in the country, trailing only Alabama and Georgia, heading into national signing day. As we approach the close of another impressive recruiting effort by UT coach Tom Herman and his staff, here’s a closer look at the Longhorns’ 2019 class. It’s awards season. De’Gabriel Floyd, inside linebacker, Westlake Village, Calif.
No player in the class took more outward pride in his pledge to Texas than the California linebacker. Floyd was constantly working on social media to entice other recruits and rep his future program. He took several trips to Austin on his own dime. Oh, and he was instrumental in keeping Texas an option for Bru McCoy throughout the recruiting process. Floyd was the face of the out-of-state audible that Herman called when it became obvious that Texas A&M and Oklahoma held the early in-state momentum for the cycle. The Longhorns were being forced to settle on lesser in-state talents or expand their search. Herman picked talent and signed 12 players from outside the state. Floyd was arguably the most important and visible. He is already enrolled at Texas and should compete for a starting spot left by the departed Gary Johnson or Anthony Wheeler. McCoy is the highest-ranked recruit Texas has signed since Aledo’s Jonathan Gray in 2012. He’s a rare athlete who’s athletic enough to play wide receiver and physical enough to be a standout at outside linebacker. McCoy’s ideal plan is to contribute on both sides of the ball, spending the majority of his time at receiver while getting in on defense on third downs and nickel situations. McCoy’s route to Texas was unprecedented as he signed with USC, then enrolled early — and then transferred to Texas a week into school. He’s now enrolled at UT and will be ready for spring practice. It’s unclear whether he’ll get to play as a freshman or if he’ll be forced to sit out a year due to the transfer rule. There’s been no announced timetable for a decision by the NCAA. Whittington is a college-ready weapon who enrolled early and is expected to play at wide receiver and running back. He scored six touchdowns in the state championship game win and was recently awarded five-star status. The 6-1 playmaker is the No. 6-ranked player on the Fabulous 55. The departure of Lil’Jordan Humphrey coupled with depth concerns at running back mean Whittington should get plenty of touches as a freshman. Maybe it was location that cost Sweat more respect from recruiting sites. Huntsville isn’t East Texas or Houston, meaning it’s not a stop that many make to watch prospects. But underestimating the three-star defensive lineman is an error. He’s only scratching the surface of his potential and is still adding weight to his 6-3 frame. Sweat can play outside in an odd-man front or at three-technique in a four-man defense. Texas recruited a potentially historic wide receiver class. We’ve discussed the value of McCoy and Whittington. 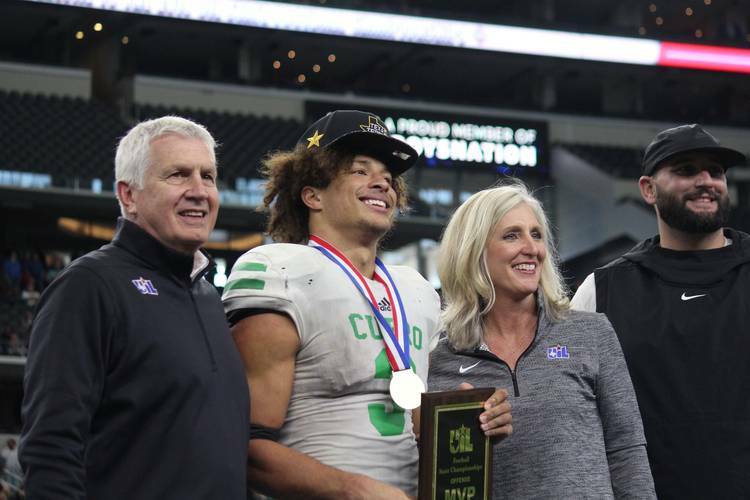 Add Jake Smith, who won the Gatorade national player of the year award, along with Marcus Washington and Kennedy Lewis, and this group could be the modern-day version of Texas’ 2000 class that included Roy Williams, B.J. Johnson and Sloan Thomas. Washington scored two touchdowns in the Under Armour All-American Game and was named the game’s MVP. Lewis is a big-bodied wide receiver with a 6-4 frame. The easiest evaluation in Texas’ class was always Johnson, a true bookend tackle with a long-term future at right tackle or at guard. He’s big. He’s mean. He’s agile. There isn’t much Johnson doesn’t possess as a prep prospect. That doesn’t mean he’s guaranteed a future in the NFL, or even at Texas, but he checks all the boxes wanted in an offensive lineman. Quarterbacks tend to be advanced socially and Johnson fits the mold. He’s mature beyond his years and was always thoughtful with his answers and accessible to reporters wanting to tell his story. Johnson is an old soul and reminded me of Caden Sterns with his ability to communicate about football and life as a teenager. There might not be a more physically impressive player in the class. Hookfin is a big and relatively lean big man who can move his feet. The combination of size and athleticism makes him the favorite in a back alley. He possesses a long reach and the size to bully most humans. No player in the class watched his stock rise more as a senior than Owens. He missed the elite camps as a sophomore and junior, keeping him out of the spotlight for recruiting services; his offer list didn’t begin to grow until the summer before his senior season. Owens is among a group of speedy recruits in the class, joining Smith, Whittington, Washington and Chris Adimora.